Windchime of Chico is beautiful. The studios are comparable. It is on a little man-made lake, and it is pretty. It is expensive because it is advertised as assisted living. As far as assisted living, if you want to pay for that, it is a very nice place. They have a nice patio overlooking the lake, which is very nice. The dining room is in a beautiful setting. The workers are very friendly. I think it is a very great place. My father-in-law has been doing OK in Windchime of Chico for about two months now. Everything is good and clean. The people are nice, and the food seems OK. The staff is good to him, but he's not been very active. Windchime has some issues with medication errors and the staff, and I’m not happy with it. It’s a nice facility with nice activities and things going on. My mom has a problem with certain staff and thinks that things are being stolen from her daily. It might just be her or it might be a real issue. There’s a lady who comes in to do weekly haircuts and also people who do pedicures. They have a lot of entertainment, which is good. A lot of people come in and play music, and there’s quite a bit of activities. Of all the places that she has been, I think Windchime is pretty good except they’ve been having a lot of problems with the medication, and the management does not pay attention sometimes. They also seem to have some staff issues. Sometimes they have people who aren’t doing too well and don’t seem to take care of patients or deal with them like they’re supposed to. They have a chef, and my mom is pretty happy with the food. People I know have been at WindChime of Chico. It's a beautiful place aesthetically, but they wanted to put my husband into the dementia area, and I said no. Also, when I checked out the dining room, the ratio of CNAs to patients was not very good. Each CNA had too many clients. The apartments were adequate, but small. They had card games, exercise, yoga, etc., but my husband is not very sociable. WindChime of Chico was a lovely place. If I needed help, that's where I think I would stay. I thought it was beautiful. The day I went there, they had their residents out and doing simple chair exercises. They were leading them through exercises and I thought that they were very patient and very pleasant. I thought this would be a good place. My mom was in WindChime for six years. Mom didn't need care then as she does now. They had ownership change and it became much less personable. They just made some changes that made it not as fun and enjoyable as it has been when she first got there. She became more physically needy as far as personal hygiene and all and they just did not seem to be able to manage that for her. So we had to put her in a smaller place who knew what her need was. The first four years, she was very happy. But when they had an ownership change, they were not as accommodating as when she was first there. She likes the food there because they work with a chef. Since there were a number of patients such as herself who do not have restricted diet, they're allowed more familiar comfort food. For the first four years she was quite active with community groups and stage plays through the social director there who was terminated when the new regime came in. For a first time assisted living environment, it was perfect for her. It was appropriate for her needs. It's very clean and is in a beautiful location so she could walk around the lake and see the ducks and the birds. She certainly enjoyed the first four years she was there, being involved with the social director and the community. She was actually on their billboard and had been interviewed for TV. Her room was one of the rooms they bring potential family members to look at because we decorated her room. She had an apartment and they were very gracious about that. We wanted her to feel like she had her own little home. My husband is at WindChime of Chico. His room has a view of a lake. The staff is doing an okay job. The food is good. The portions are good; they have a larger meal at lunch time and a smaller meal at dinner time. The facility is clean and new. this facility is very clean and attractive. the staff seems very friendly and willing to help the residents and guest. the meals look appealing and smell good too. my grandmothers room is spacious, but sparsely decorated. she has a small refrigerator, a microwave and a sink basin in the room along with a private bathroom with all necessary safety rails and handholds. there seem to be ample social activities for the residents and there are many events that family of residents are invited to. even though my grandmother usually thinks that she is still living at home, she still seems comfortable. the facility could do a bit better providing transportation to and from doctor's appointments. 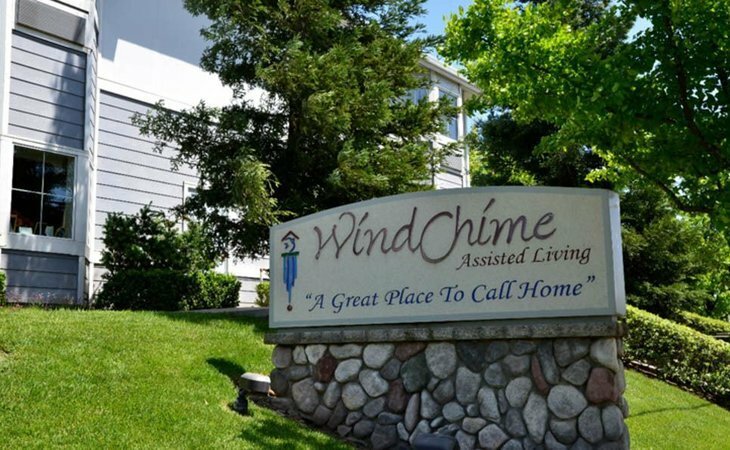 We were in the Chico, CA area and decided to see about visiting the WindChime assisted living facility. The staff was very accommodating, despite the fact that we did not have an appointment. They had a genuine interest in learning about our uncle and what kind of life he'd had, so that they could compare his needs to what they had to offer. Our uncle was a very socially active person who enjoyed regular golf, discussing current events with friends and many culturally stimulating activities. He has some health issues now which make it harder for him to do these things on his own, such as sciatica, early Alzheimer's and diabetes. The grounds were very well manicured, with lush greenery. There were many views of the ocean from inside the property, with ample seating areas. The nearby Oxford Suites would be a great place to stay for the family and friends of residents who wish to extend their visits. The nearby California Park Lake also had stunning views. The rooms were all beautifully designed, well appointed and comfortable. The activities and programs offered seemed comprehensive enough to suit any taste, from card games to local cultural events. The recreational exercise programs and socializing included plenty of featured entertainment, such as movie nights and other outings. The home-style food we sampled included healthy mixed greens, quiche and corn chowder, which we chose from breakfast, lunch and dinner menus. It was as good, if not better, than what one might find at an upscale restaurant. There was an unmistakeable pride that the owner and his staff takes in caring for the residents, which really impressed us. My mom is doing fine at Windchime of Chico. We are very pleased with it. Their caregivers are very thorough. I'm always getting unsolicited information about my mom. They keep me apprised of what is going on. Everything seems to be going smoothly. They have a full calendar with four or five activities a day that are available. There are currents events, exercise once or twice a day, walking club, some arts and crafts, and there is a person that visits from my church once a week, which is nice. They have a lot of music, too. They offer hairdressing and podiatry, outings where they go outside, and housekeeping. They provide three meals a day as well. The staff members are very good. The place is very clean. It is a good value, too. We are so honored you chose Windchime Senior Living to care for your mom. She is a delight! We know transition can be difficult, when moving a loved one. We are happy she has settled in very quickly. Please keep us informed how we can make her stay more rewarding. Our commitment for exemplary care and community, is our heartfelt desire for each and every resident. Thank you for your valuable feedback. At Windchime of Chico, we want our residents to live their lives to the fullest. With quick access to medical services and spectacular views of California Park Lake, our location is ideal for seniors and their families. Our “assistance as you need it” options offer the peace of mind of a helping hand and the independence to still do what you want, when you want. If you’re looking for a senior living community with flexible care plans that are built with you in mind, we look forward to meeting you. Lake views, lodge like feel, large fireplace in great room, courtyard, and much more! What should caregivers and potential residents know about Windchime of Chico?